YA series are certainly not a new phenomenon. I grew up reading them. First, it was Nancy Drew. 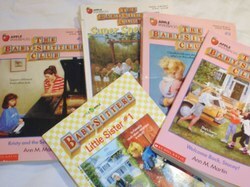 Then, I moved on to the Baby-sitters Club and the Sweet Valley High books. YA series in the 90s seemed to go on forever, with literally hundreds of books following a similar formula. And we kids of the nineties simply devoured them! One of the great YA series of yesteryear, The Baby-sitters Club. Now, however, I’ve noticed a trend of shorter series in YA literature. The Twilight Saga and The Hunger Games Trilogy are certainly the most well-known examples. But even outside the world of paranormal and dystopian YA fiction, there are tons of series. They’re becoming a trend in contemporary YA fiction as well. I just read two Stephanie Perkins books, Anna and the French Kiss and Lola and the Boy Next Door, which feature a cast of recurring characters. I’m eagerly anticipating the next novel in the series, Isla and the Happily Ever After, which will center on a character who made a brief appearance in Anna and the French Kiss. Another example is Miranda Kenneally’s Hundred Oaks series; the characters go to the same school, and even though they’re not all from the same clique, they reappear in subsequent books. These short series benefit readers and writers alike. Readers enjoy them because of the continuity–the characters become familiar, like old friends. And it’s interesting to see the development of a character who, in a previous book, may have only made occasional cameo appearances. Writers enjoy series because they can reuse characters and settings, saving the trouble of dreaming up a whole new batch. And, best of all, book sales spike as readers are drawn into the lives and loves of the characters. Series are the best way for authors to create the literary equivalent of customer loyalty, since a good series has readers coming back again, eagerly anticipating the release of the next book. I read those too! I used to get into my brother’s Hardy Boys books! They were awesome.